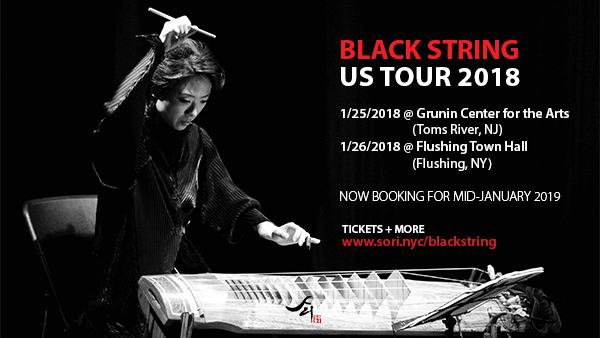 (JANUARY 2019) SORI Artist 2019 Tour kicks off with Black String and Noreum Machi visiting 8 cities in the U.S. Make plans to see the global sounds from Korea! These tours are generously supported by the Korea Foundation. (JULY 2018) The Global Sounds of Korea on Tour! SORI is proud to announce the Summer 2018 tour schedule visiting 16 cities throughout the U.S. and Canada. Make plans to see the global sounds from Korea! Black String has become one of the winners of the tenth Songlines Music Awards. The awards aim to put a much-deserved spotlight on some incredibly talented artists from around the world, and Black String will perform at the inaugural awards ceremony on October 20 at Electric Brixton. SORI 2018 Summer/Fall tour schedule announcing soon including Noreum Machi, Korean Men feat. Lee Heemoon & Prelude, and Coreyah. 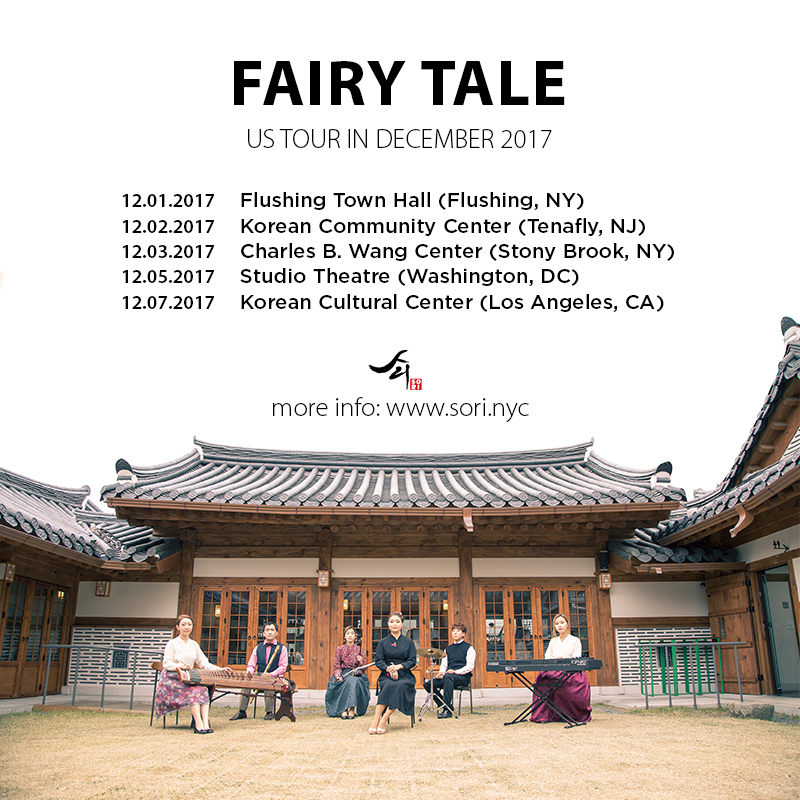 Unbound by genre definitions music, NYC-based Korean music agency SORI presents a dynamic showcase at APAP Conference NYC 2018 featuring three Korean artists who bridge musical categories of traditional, jazz, pop, and world music. Born in Korea and raised in Seattle, violinist-looper, vocalist, and composer Joe Kye has drawn rave reviews since launching his music career in 2013, “discharging world[s] of emotion” and delivering “divine messages” with his lush string loops and eclectic style (Guitar World). Drawing upon his migrant upbringing, Kye blends indie-rock, jazz, classical, pop, and world folk to create a unique sound that “leaves everyone in awe” (Sac News and Review). "A single violinist...one mesmerizing symphony" (Sacramento Bee). As a gayageum player, composer and improviser, Park Kyungso sways between traditional and contemporary music – a truly preeminent contemporary musician. Kim Chaek takes inspirations from all continents- Asia, Africa, Europe, and the Americas- and translates them with the beautiful language of drums and percussions. Although the music of Park Kyungso X Kim Chaek started from different roots, their music is presented through the common denominator of Korean music, improvisation and avant-garde. A duet of gayageum and jazz drums will invite audience to a new level of musical experience that they have never seen before. THANKS! The event was a big success! check our event photos on Facebook! We've reached our Indiegogo campaign goal! (JANUARY 10, 2018) HUGE THANKS to 42 backers who contributed to our indiegogo campaign, we've reached our goal! 100% of proceeds will be used to support SORI 2018 artists including partial funding for travel and lodging for artists and staff from Korea; hospitality for artists, guests, and staff; local travel; photo and video production; staff and the showcase production expenses. Presenting new sounds from the ancient instruments of Korea, Black String performs in the US in January 2018. SORI Artists performing at SummerStage NYC! For the first time in the SummerStage's 32-year history, Korean artists take center stage at this iconic NYC event. The Korean Cultural Center New York and SummerStage present Korea GAYOJE, performances blending Korean sounds with glam rock, contemporary world music, and a hip hop headliner. Please join us for a night of "mesmerizing and wonderful" folkloric world music with Coreyah, the magnetic glam rock of SsingSsing, and the defining lyrical flow of Year of the OX with DJ Zo. We can't believe it's really happening! SORI artist SsingSsing will be performing at NPR Music's Tiny Desk! Stay tuned for the video! Performance is on Tuesday, 6/27/2017 and the video should be up in September 2017. Sign up HERE to get updates.